DT makes second visit to Texas, meets with storm survivors. White House is requesting more than $14 billion for Harvey relief. It is up to Congress to approve the proposal. Justice Department says there is no evidence that Obama wiretapped Trump Tower. DT is considering pulling out of a major trade agreement with South Korea. DT’s nominee to fill the USDA chief scientist position is not actually a scientist. DT’s nominee to head NASA is also not a scientist. Maybe try skipping that part just this once? Secretary of State Rex Tillerson thanks Mexico for offering assistance during Hurricane Harvey, but will not say if the U.S. will accept the aid. Congress debates the future of the Federal Flood Insurance Program, which helps victims of storms like Harvey. DT Jr. agrees to testify privately before the Senate Judiciary Committee. In Missouri, DT announces a plan to overhaul the tax system, without offering details. The DT administration blocks a rule requiring employers to provide pay data broken down by race and gender, part of an Obama-era effort to address discriminatory pay practices. Secretary of Defense Jim Mattis says transgender service members can remain in the military until a study on how to implement the transgender ban is completed. 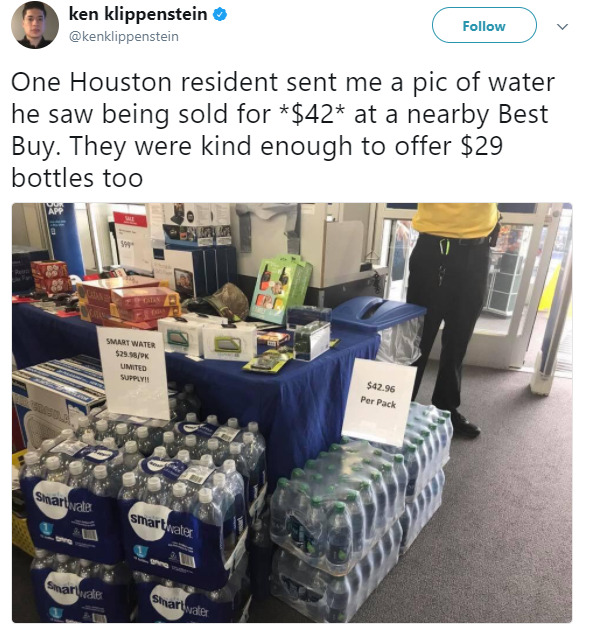 companies who are monopolizing on devastation to up sales should be boycotted.